Parents who have their sons circumcised risk criminal prosecution in countries like Germany. Under some circumstances, religious practices aren’t part of the private sphere. Discussions of male circumcision have been heated, and have clearly showed the vault lines between the different camps. When worlds collide, an amicable solution that pleases all interested parties is virtually impossible. This is especially true in the case of circumcision, which now transcends the concrete question and has been turned into a more general debate about the role of religion (and religious symbols) in a modern and secular society. In addition to circumcision, the permissibility of crucifixes in schools or the prohibition of the veil are also up for discussion. Religion is a private matter that must not be interfered with by the state. The liberal state guarantees that everyone is free to choose their own religion, practice it, and is protected from discrimination in the basis of his or her religious affiliation of beliefs. This is the outcome of a long reform process in Europe: without the age of Englightenment, we might still be embarking on crusades or burning witches at the stake. But many orthodox interpretations of religion – whether they are Christian, Jewish, or Muslim – don’t accept modern views. This helps to explain the strong reactions against circumcision, which is regarded not as an understandable religious act but as an affront against free will and as a relict of pre-Enlightenment thought. It’s also possible to consider circumcision in light of existing laws from a criminological or legal perspective. Some facts are clear: circumcision represents an irreversible interference with the bodily integrity of the child. It is performed on boys at an age when they are too young to freely decide about the procedure or their religious affiliation. Circumcision is not only painful and poses certain medical risks, it also results in a changed physical appearance. Experiences of pediatricians and psychotherapists indicate that circumcised boys are sometimes traumatized by the procedure and continue to suffer from it for the rest of their lives. Every fifth circumcision still results in medical complications, even when performed in a proper manner. 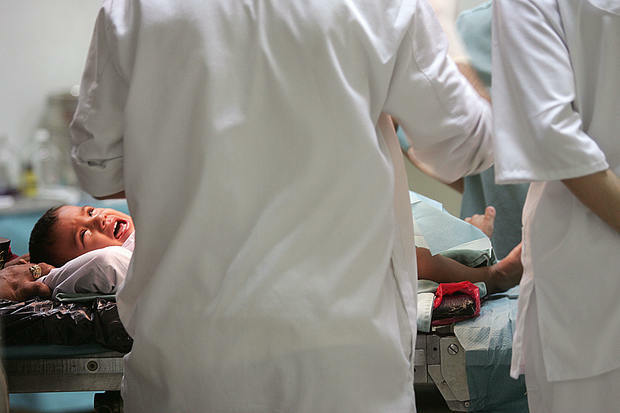 A German provincial court has recently ruled that male circumcision was impermissible, and partially based its argument on the case of a four-year old boy who suffered from serious complications after a properly performed procedure. From a legal perspective, religious circumcision amounts to bodily harm, comparable to other forms of physical assault that are usually spelled out in the penal code. From a legal perspective, it does not matter whether an attack was carried out using a baseball bat or a scalpel. Some scholars even argue that circumcision should be classified as “serious assault” under the German penal code, a move that would imply a prison term of up to ten years in serious cases, and up to five years in less serious cases. The relatively high prison terms illustrate how highly valued bodily integrity is before the law. Since children – especially babies and infants – cannot consent to procedures that would violate their right to bodily integrity, the right to consent is legally vested in the parents or guardians of the child. But they cannot legally consent to any procedure: violations of bodily integrity are permissible only insofar as they benefit the child (for example, the consent to have vital surgery performed on the child). In the case of circumcision, this is only the case when a persuasive medical reason exists to justify the procedure. German law does not permit violations of bodily integrity that serve the freedom of religion of the parents. Freedom of religion is limited by strong considerations of the rights of the child. Under this framework, tradition cannot suffice as a justification for the violation of important rights – a legal interpretation that was affirmed in 2000, when a court ruled that physical punishment of children was illegal even in places where it had historically been carried out on a routine basis. Physical punishments, psychological torments, and other degrading measures are impermissible as educational tools. Even if the German parliament passed a law to allow male circumcision, the Constitutional Court would be likely to reverse it. To make it clear: those parents who opt to have their sons circumcised in Germany today are risking criminal prosecution. This does not mean – as some voices from the Jewish and Muslim communities have charged – that the country is intolerant, xenophobic, or anti-Semitic. Those arguments are shortsighted or simply false: a discussion of male circumcision is occurring in many other countries as well. Some have moved to prohibit the practice, while others have not yet reached a conclusion and will look to Germany for future guidance. Children cannot protect themselves. Thus, it is the responsibility of the community to offer protection. The prohibition of male circumcision isn’t a sign of anti-religious hostility but of a commitment to the rights of the child. Read more in this debate: Gert van Dijk, Brian Morris, Aiman Mazyek. André Schulz is the president of the German Association of Police Detectives. He has been a policeman since 1990.